The node increments its value in each cycle by the value of the 'Inc' input. Whenever the 'T' input receives a trigger signal, the output resets to the initial (start) value received on the input 'Str'. Str: Start value. 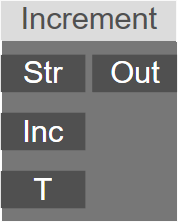 When a trigger happens at the 'T' input, the output resets to this value. Inc: Increment value. In each computation cycle the outputs increments by this value. T: If the input is non zero, the output resets to the value of the 'Str' input. Out: The current value of the incrementation.